For April and May 2005, adventurer Lorenzo Gariano was part of a ten-man collaborative expedition between 7summits.com and the 7summits Club from Russia, led by Alex Abramov and Harry Kikstra, to the North Face of Everest. Visitors were able to follow his progress through his audio blog and GPS position reports on these pages. Everest is called Chomolungma "Goddess Mother of the World" in Tibetan and Sagarmatha "Goddess of the sky" in Nepalese but was renamed Everest after Sir George Everest, the first Surveyor-General of India. If you'd like to hear more about Lorenzo's adventures, from the man himself, you might like to watch the replay of his talk that he and Noel Hanna gave at the OU on the evening of Thursday 16th November 2006. Lorenzo returned to Everest with the 7summit Club in April and May 2006 for another attempt on the summit. Once again he submitted audio reports and this time, images to the blog on this website. Having successfully summited, Lorenzo then immediately began another adventure, accompanying Noel Hanna (with whom he summited) on part of his world record cycling challenge (each of the Seven Summits followed by cycling to sea level on each continent), to the coast of India in the Bay of Bengal, monitored by Guiness. Lorenzo is hoping to raise awareness of the refugees from Tibet who are now living in India - read Lorenzo's letter of intent. View Lorenzo's blog of voice messages and photos. Most recent recording made at Fri 16 Jun 2006 06:00 UK time. Most recent incoming SMS position report messages. Note that the accuracy is dependant on the quality of the GPS signal at the time - altitude is always less accurate than lat/long. If there is no map link, the fix was sent from outside our mapping area. Click to view all his GPS reports. Click to see profiles of Lorenzo's progress (based on the SMS position reports above). 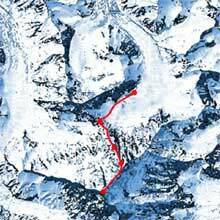 KMi were involved in Lorenzo's previous adventures to The Matterhorn (4478m) in August 2002 and to Lhotse (8511m, adjacent to Everest, South side) in May 2003. Read more about Lorenzo's Seven Summits challenge. These pages are the personal responsibility of Lorenzo Gariano and the members of KMi who are supporting him. The views expressed here do not necessarily represent the views of the Open University. The University takes no responsibility for any material on these pages.